Science has gone too far. One minute you're enjoying a spot of light testing, the next you're trapped in the infinite, unknowable void between dimensions, outside of space and time itself, staring at the side of your own head through a kaleidoscope. It's remarkable no one has tried it before. 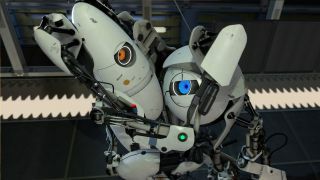 YouTuber CrowbCat used the Portal 2 SDK to set up a test chamber in which two portals could be brought face-to-face. In keeping with scientific spirit, he jumped on in. Somehow, the game doesn't crash and the result is fun to pass off as part of the lore of the universe. In one of an infinite number of Portal timelines, Chell is lost in the orange and blue folds of the fabric of reality. What a way to go.